Click and Relax is a free meditation tool to play nature sounds with corresponding nature scene. It has a collection of ambient sounds like rain, forest, fire, rustling of the grass, falling snow, bubbling brook, noise of surf, skulls, and some others. And the best part is that when you play any sound from the list, it places the corresponding scene on the screen. For example, if you play fire or rain sound, then it will show you nature wallpaper like image on your computer screen. This tool is available online, as a PC software and as a Chrome extension. But in this post, I will be using the online version of this tool. Because in the PC version, it only plays nature sounds. If you work for long hours, then you should take some rest for a short time and you can use this tool. Also, if you are suffering from sleep deprivation due to some reasons, then this tool can be a good option for you. You can listen to the soothing sounds and then see the corresponding nature view to relax your mind or fall asleep. You can use the online version of the tool without creating an account. 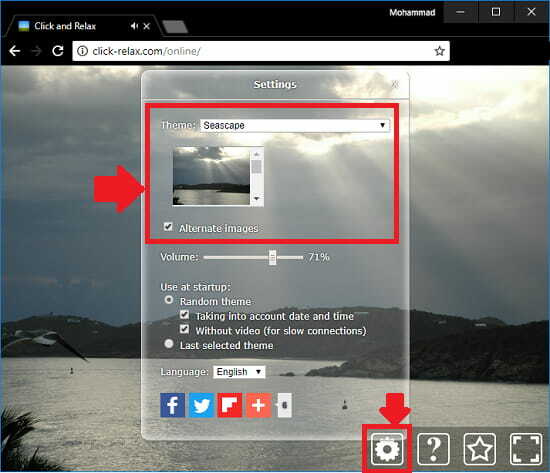 Just choose any sound and let it play that in the browser along with the corresponding nature scene. Click and Relax is very simple meditation tool that you can use in your browser to listen to the soothing sounds. Also, there are other meditation software or break reminder software that you can use but the tool here is quite different from them. On top of that, it runs directly in browser and you don’t really have to install anything to use it. It just needs an active internet connection to work. Here is how to use this free mediation tool to play nature sounds with corresponding nature sounds. Step 1: Go to the homepage of Click and Relax tool and then hit the play button. It will start playing a default sound and will show you the corresponding nature scene. Step 2: To change the correct sound, simply click on the gear icon from the bottom right side. It will open a pop up like menu in front you. From the pop up, you can choose any sound and then play it. You can also control the volume of the sound there. Step 3: After selecting a desired sound for you, you can play it and it will keep playing the sound until the tab is active. Also, there is an option in the tool to switch to full screen. That is how this free meditation tool works to play nature sounds with corresponding nature scenes. You can use this tool very easily and then do whatever you want. If you’ve been looking for a meditation tool that plays soothing sound and shows the corresponding nature scenes, then you can try Click and Play. It is handy and a very nice tool that you can use to meditate yourself during heavy work hours.